Welcome to Princessa, you will have a great experience in our property, you have great amenities and fantastic time. Spend the day in one of our 3 pools, exercise in the exercise area in our club house, or play some volley ball in the beach volleyball court across the way from the club house. Have a cook out at our BBQ areas or eat out at our fun restaurant Collin's with the friendliest staff. We have 24 hour security for your tranquility. B 306 is a 2 bedroom and 2 bathroom condo is located on the 3rd floor of the B Tower. 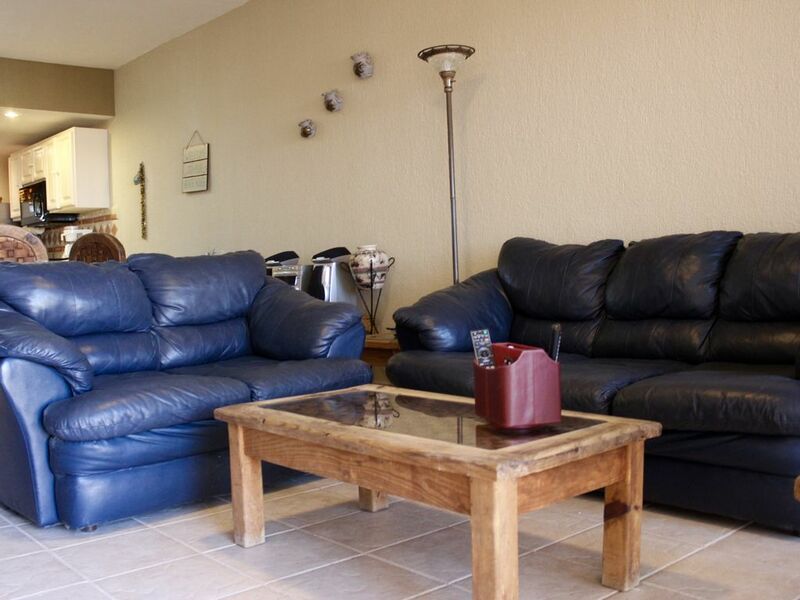 This condo has an ocean view with accommodations for 4 guests. In the living room there is a large navy blue sofa with a matching navy blue love seat. The room also includes two oak wood end tables with lamps, an oak wood coffee table and a matching media unit. The media unit has a large TV, DVD, VCR and CD player. In addition you are able to get online with the high speed wireless network and watch your shows on the cable television. You can get to the terrace through the sliding arcadia doors off the living room. In the dining room there is a round teak wood table with four royal blue fabric covered chairs. The room has a dark alder wood console table and a wall mounted silver framed mirror. The room also has a wicker covered bench where you can put your shoes on and off. In the kitchen there are ceramic tiled counter tops with black appliances and fully stocked cabinets and drawers. You will find all the items needed to feel as if you are cooking in your own home kitchen. There is a counter top bar off the kitchen lined with bar stools for casual dining. In the master bedroom there is a queen size bed with an arched maple wood head board that has a metal leaf work design in the arch. The bedding is a pattern of gold, navy blue and white with colorful accent pillows. There is one maple wood bed side table with a lamp and a maple console table that holds a TV / DVD player. You can hang your clothing ion either of the small double door closets that surround the bay view window. The window has maple wood blinds and a green valance on top to compliment the colors of the room. The attached master bathroom has a single sink mirrored vanity with an additional mirrored closet on the other side. The private bathroom has a shower, tub and commode. In the 2nd guest bedroom there is a queen size bed with an arched wood head board and soft pastel patterned bedding. The room includes two maple wood bed side tables with lamps and a dresser with a TV. The room has a large double mirrored door closet and a view window. The hall bathroom has a walk in travertine shower with a commode and single sink mirrored vanity. The terrace has a round glass top table and four chairs. The terrace would be the perfect spot to kick back and relax with a cold beer or frozen margarita while you feel the warm ocean air kiss your skin. You should definitely dine outside in the evenings so that you can witness the world's most beautiful sunsets or take a walk to Colins Contina located there. Take a 2 hour trip on Señorita Rita..Book your trip to paradise now!